How to get import licence in Mali? 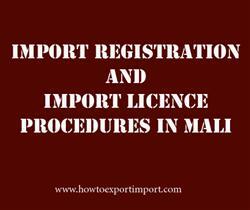 What are the procedures for registration as an importer in Mali? How to start an import business in Mali? What are the certification formalities to import to Mali? How to get the status of an importer in Mali? This post explains about import registration procedures to be obtained from Mali government authority for importation to Mali. Inorder to secure the status of exporter or importer to/for Mali are carried out by fulfilling the following things such as Registration in the trade register, Issuance of the Import/export tax and Fiscal identification (Numbers assigned by the Public Tax Administration which serves as Identification Code for companies). This information is about import licensing procedures to import goods to Mali. If you have to add more information about import permit and registration required to import goods to Mali, share below your thoughts.